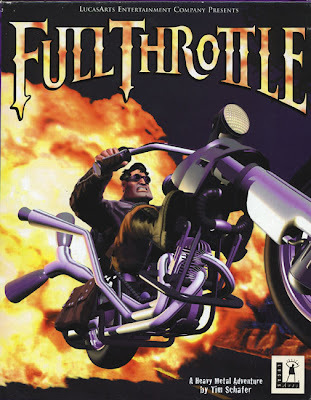 Full Throttle was Tim Schafer's first game as the sole project leader, and was released on April 30, 1995. The game is set in a futuristic setting, and follows Ben Throttle, the leader of a biker gang called The Polecats. Ben is soon framed, and must discover who is behind the frame-up and why. What he discovers threatens to destroy his very way of life. Full Throttle is now supported by ScummVM, a program designed to let 2D adventure games run on multiple platforms. With ScummVM, Full Throttle now runs on modern versions of windows, as well as Linux, Mac OS X, and many consoles such as Dreamcast, Wii, PlayStation 2, and PlayStation Portable. For a complete list of platforms supported by ScummVM, see here. The original version of Full Throttle is out of print, but since it was released at retail, it can still be purchased on the used games market. There's good news for those looking for an affordable and easy way to obtain the game however, as Double Fine has announced that they will be creating their own Full Throttle high definition remake, Full Throttle Remastered. It will be released some time in 2017.